The Cambodian genocide (Khmer: ហាយនភាពខ្មែរ or ការប្រល័យពូជសាសន៍ខ្មែរ) was carried out by the Khmer Rouge regime under the leadership of Pol Pot, and it resulted in the deaths of between 1.671 and 1.871 million people from 1975 to 1979, or 21 to 24 percent of Cambodia’s 1975 population. The Khmer Rouge wanted to turn the country into a socialist agrarian republic, founded on the policies of ultra-Maoism. In 1976, the Khmer Rouge changed the name of the country to Democratic Kampuchea. In order to fulfill their goals, the Khmer Rouge emptied the cities and forced Cambodians to relocate to labor camps in the countryside, where mass executions, forced labor, physical abuse, malnutrition, and disease were prevalent. This resulted in the death of approximately 25 percent of Cambodia's total population. Approximately 20,000 people passed through the Tuol Sleng Centre (also known as Security Prison S-21), one of the 196 prisons operated by the Khmer Rouge, and only 7 adults survived. The prisoners were taken to the Killing Fields, where they were executed (often with pickaxes in order to save bullets) and buried in mass graves. The abduction and indoctrination of children was widespread, and many were persuaded or forced to commit atrocities. The genocide triggered a second outflow of refugees, many of whom escaped to neighboring Vietnam and, to a lesser extent, Thailand. The Vietnamese invasion of Cambodia ended the genocide by defeating the Khmer Rouge in 1979. 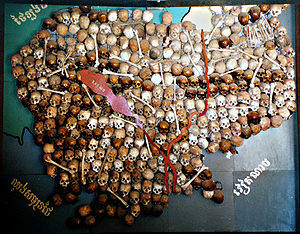 Map made with skulls of the regime's victims, exhibited at the Tuol Sleng Museum. On 2 January 2001, the Cambodian government established the Khmer Rouge Tribunal, to try the members of the Khmer Rouge leadership responsible for the Cambodian genocide. Trials began on 17 February 2009. On 7 August 2014, Nuon Chea and Khieu Samphan were convicted and received life sentences for crimes against humanity during the genocide. As of 2009, the Cambodian NGO Documentation Center of Cambodia has mapped some 23,745 mass graves containing approximately 1.3 million suspected victims of execution. Direct execution is believed to account for roughly 60% of the full death toll during the genocide, with other victims succumbing to starvation or disease. The Khmer Rouge regime frequently arrested and often executed anyone suspected of connections with the former Cambodian government or foreign governments, as well as professionals, intellectuals, the Buddhist monkhood, and ethnic minorities. As a result, Pol Pot has been described by journalists and historians, William Branigin for example, as "a genocidal tyrant". British sociologist Martin Shaw described the Cambodian genocide as "the purest genocide of the Cold War era". The attempt to purify Cambodian society along racial, social and political lines led to purges of the Cambodia's previous military and political leadership, along with business leaders, journalists, students, doctors, and lawyers. Ethnic Vietnamese, ethnic Thai, ethnic Chinese, ethnic Cham, Cambodian Christians, and other minorities were also targeted. The Khmer Rouge forcibly relocated minority groups and banned the use of minority languages. By decree, the Khmer Rouge banned the existence of more than 20 minority groups, which constituted 15% of the country's population. The Khmer Rouge initially ordered the expulsion of ethnic Vietnamese from Cambodia but then massacred large numbers of that population as they attempted to flee the country. The regime then prevented the remaining 20,000 ethnic Vietnamese from fleeing, and much of this group was also executed. The Khmer Rouge also used the media to support their goals of genocide. Radio Phnom Penh called on Cambodians to "exterminate the 50 million Vietnamese." Additionally, the Khmer Rouge conducted many cross-border raids into Vietnam where they slaughtered an estimated 30,000 Vietnamese civilians. Most notably, during the Ba Chúc massacre in April 1978, the Khmer Rouge military crossed the border and entered the village, slaughtering 3,157 Vietnamese civilians at once. This forced an urgent response from the Vietnamese government, precipitating the Cambodian–Vietnamese War in which the Khmer Rouge was ultimately defeated. The state of the Chinese Cambodians during the Khmer Rouge regime has been described as "the worst disaster ever to befall any ethnic Chinese community in Southeast Asia." Cambodians of Chinese descent were massacred by the Khmer Rouge under the justification that they "used to exploit the Cambodian people". The Chinese were stereotyped as traders and moneylenders associated with capitalism, while historically the group had attracted resentment due to their lighter skin color and cultural differences. Hundreds of Chinese families were rounded up in 1978 and told that they were to be resettled, but were actually executed. At the beginning of the Khmer Rouge regime in 1975, there were 425,000 ethnic Chinese in Cambodia; by the end of 1979 there were just 200,000. Furthermore, the Chinese were predominantly city-dwellers, making them vulnerable to the Khmer Rouge's revolutionary ruralism and evacuation of city residents to farms. The government of the People's Republic of China did not protest the killings of ethnic Chinese in Cambodia. According to Ben Kiernan, the "fiercest extermination campaign was directed against the ethnic Cham Muslim minority." Islam was seen as an "alien" and "foreign" culture that did not belong in the new Communist system. Initially, the Khmer Rouge aimed for the "forced assimilation" of Chams through population dispersal. Pol Pot then began using intimidation efforts against the Chams that included the assassination of village elders but ultimately ordered the full-scale mass killing of Cham people. American professor Samuel Totten and Australian professor Paul R. Bartrop estimate that these efforts would have completely wiped out the Cham population were it not for the overthrow of the Khmer Rouge in 1979. Under the leadership of Pol Pot, who was an ardent atheist, the Khmer Rouge had a policy of state atheism. According to Catherine Wessinger, "Democratic Kampuchea was officially an atheist state, and the persecution of religion by the Khmer Rouge was matched in severity only by the persecution of religion in the communist states of Albania and North Korea." All religions were banned, and the repression of adherents of Islam, Christianity, and Buddhism was extensive. It is estimated that up to 50,000 Buddhist monks were massacred by the Khmer Rouge. Ideology played an important role in the genocide. Pol Pot was influenced by Marxism and desired an entirely self-sufficient agrarian society free from all foreign influences. Stalin's work has been described as a "crucial formative influence" on Pol Pot's thought. Also heavily influential was the work of Mao Zedong, particularly his On New Democracy. In the mid-1960s, Pol Pot reformulated his ideas about Marxism–Leninism to better suit the Cambodian situation aimed to bring Cambodia back to its "mythic past" of the powerful Khmer Empire, to stop corrupting influences like foreign aid and western culture, and to restore the country to an agrarian society. Attempts to implement these goals were key factors in the ensuing genocide. One Khmer Rouge leader said that the killings were meant for the "purification of the populace." The Khmer Rouge forced virtually the entire population of Cambodia into mobile work teams. Michael Hunt said that it was "an experiment in social mobilization unmatched in twentieth-century revolutions." The Khmer Rouge used an inhumane forced labor regime, starvation, forced resettlement, land collectivization, and state terror to keep the population in line. Historian Ben Kiernan has compared the Cambodian genocide to the Armenian Genocide perpetrated by the Ottoman Empire and the Holocaust perpetrated by Nazi-era Germany. While each was unique, they shared certain common features. Racism was a major part of the ideology of all three of the genocidal regimes. All three targeted religious minorities and tried to use force of arms to expand into what they believed to be their historical heartlands (the Khmer Empire, Turkestan, and Lebensraum respectively), while all three regimes "idealized their ethnic peasantry as the true 'national' class, the ethnic soil from which the new state grew." The Khmer Rouge regime is also well known for having practiced torture and medical experiments. There are many accounts of torture in both the S-21 records and the documents of the trial. Tortures were not only meant to force the prisoner to confess, they were also used for amusement among the prison guards. They feared that they would become themselves prisoners of the same prison if they treated the prisoners well. Moreover, unlike other totalitarian regimes (such as Nazism) where soldiers and guards were adults and normally suffered from psychological stress when they had to carry out mass killings with rifles (which was one of the reasons that led to the adoption of gas chambers), prison guards of the Khmer Rouge regime were just youths and most of them could not even realize in full what they were doing. The previous doctors were killed or sent to the countryside to work as farmers during the Khmer Rouge and the library of the Medical Faculty in Phnom Penh was set on fire. The regime then employed child medics, who were just teenagers with no or very little training in that job. They did not have any knowledge of Western medicine (which had been forbidden since it was considered a capitalist invention), and they had to practice their own medical experiments and make progress by themselves. They did not have Western medicines (since Cambodia, according to the Khmer Rouge, had to be self-sufficient) and all the medical experiments were systematically conducted without anesthetics. A medic who worked inside S-21 told that a 17-year-old girl had her throat slit and her abdomen pierced before being beaten and put into water for the whole night. This procedure was repeated many times and it was carried out without anesthetics. In a hospital of Kampong Cham province, child medics cut out the intestines of a living non-consenting person and they joined their ends in order to study the healing process. The patient died after three days due to the "operation". In the same hospital, other "physicians" trained by the Khmer Rouge opened the chest of a living person, just to see the heart beating. The operation resulted in the immediate death of the patient. Other testimonies, as well as the policy itself implemented by the Khmer Rouge, suggest that those were not just isolated cases. They also performed drug testing, for instance by injecting coconut juice into a living person's body and studying the effects. Coconut juice-injection was often lethal. The book Cambodge année zéro ("Cambodia Year Zero") by François Ponchaud was released in 1977 and translated into English in 1978. Ponchaud was one of the first authors to bring the Cambodian genocide to the world's attention. Ponchaud has said that the genocide "was above all, the translation into action the particular vision of a man [sic]: A person who has been spoiled by a corrupt regime cannot be reformed, he must be physically eliminated from the brotherhood of the pure." Murder of a Gentle Land: The Untold Story of a Communist Genocide in Cambodia by John Barron and Anthony Paul was published in 1977. The book drew on accounts from refugees, and an abridged version published in Reader's Digest was widely read. In 1973, Kenneth M. Quinn of the United States embassy raised concerns over the atrocities being carried out by the Khmer Rouge during the Cambodian Civil War. In a report, he stated that the Khmer Rouge had "much in common with those of totalitarian regimes in Nazi Germany and the Soviet Union." Quinn has written of the Khmer Rouge: "[w]hat emerges as the explanation for the terror and violence that swept Cambodia during the 1970s is that a small group of alienated intellectuals, enraged by their perception of a totally corrupt society and imbued with a Maoist plan to create a pure socialist order in the shortest possible time, recruited extremely young, poor, and envious cadres, instructed them in harsh and brutal methods learned from Stalinist mentors, and used them to destroy physically the cultural underpinnings of the Khmer civilization and to impose a new society through purges, executions, and violence." During the genocide, China was the main international patron of the Khmer Rouge, supplying "more than 15,000 military advisers" and most of its external aid. As a result of Chinese and Western opposition to the Vietnamese invasion of 1978 and 1979, the Khmer Rouge continued to hold Cambodia's United Nations seat until 1982, after which the seat was filled by a Khmer Rouge-dominated coalition known as the Coalition Government of Democratic Kampuchea. Motivated by its opposition to Vietnam, China trained Khmer Rouge soldiers on its soil from 1979 to at least 1986, "stationed military advisers with Khmer Rouge troops as late as 1990," and "supplied at least $1 billion in military aid" during the 1980s. After the 1991 Paris Peace Accords, Thailand continued to allow the Khmer Rouge "to trade and move across the Thai border to sustain their activities... although international criticism, particularly from the United States and Australia... caused it to disavow passing any direct military support." There are also allegations that the United States directly or indirectly supported the Khmer Rouge to weaken Vietnam's influence in Southeast Asia. The Khmer Rouge exploited thousands of desensitized, conscripted children in their early teens to commit mass murder and other atrocities during and after the genocide. The indoctrinated children were taught to follow any order without hesitation. The organization continued to use children extensively until at least 1998, often forcibly recruiting them. During this period, the children were deployed mainly in unpaid support roles, such as ammunition-carriers, and also as combatants. Many children had fled the Khmer Rouge without a means to feed themselves, and believed that joining the government forces would enable them to survive, although local commanders frequently denied them any pay. On 15 July 1979, following the overthrow of the Khmer Rouge, the new government of Cambodia passed "Decree Law No. 1." This allowed for the trial of Pol Pot and Ieng Sary for the crime of genocide. They were given an American defense lawyer, Hope Stevens, and were tried in absentia and convicted of genocide. In January 2001, the Cambodian National Assembly passed legislation to form a tribunal to try additional members of the Khmer Rouge regime. In 1999, Kang Kek Iew ("Comrade Duch") was interviewed by Nic Dunlop and Nate Thayer and admitted his guilt for crimes carried out in Tuol Sleng prison, where up to 17,000 political prisoners were executed. He expressed sorrow for his actions, stating that he was willing to stand trial and give evidence against his former comrades. During his trial in February and March 2009, Duch admitted that he was responsible for the crimes carried out at Tuol Sleng. On 26 July 2010, he was found guilty on charges of crimes against humanity, torture, and murder and was sentenced to 35 years in prison. On 3 February 2012 his previous sentence was replaced with life imprisonment. Nuon Chea ("Brother Number Two") was arrested on 19 September 2007. At the end of his 2013 trial he denied all charges, stating that he had not given orders "to mistreat or kill people to deprive them of food or commit any genocide." He was convicted in 2014 and sentenced to life imprisonment. He has expressed remorse and accepted moral responsibility for his crimes, stating "I would like to sincerely apologize to the public, the victims, the families, and all Cambodian people." After being located in an opulent Phnom Penh villa, Ieng Sary was arrested on 12 November 2007 and indicted for crimes against humanity, as was his wife Ieng Thirith, who had been an unofficial adviser to the regime. On 17 November 2011, following evaluations from medical experts, Thirith was found to be unfit to stand trial due to a mental condition. Sary died of heart failure in 2013 while his trial was in progress. Another senior Khmer Rouge leader, Khieu Samphan, was arrested on 19 November 2007 and charged with crimes against humanity. He was convicted in 2014 and sentenced to life imprisonment. At a hearing on 23 June 2017, Samphan stated a desire to bow to the memory of his guiltless victims, while also claiming that he suffered for those who fought for their ideal to have a brighter future. A few months before his death on 15 April 1998, Pol Pot was interviewed by Nate Thayer. During the interview, he stated that he had a clear conscience and denied being responsible for the genocide. Pol Pot asserted that he "came to carry out the struggle, not to kill people." According to Alex Alvarez, Pol Pot "portrayed himself as a misunderstood and unfairly vilified figure". In 2013, Cambodian Prime Minister Hun Sen passed legislation that prohibits the denial of the Cambodian genocide and other war crimes committed by the Khmer Rouge. The legislation was passed despite comments by opposition leader Kem Sokha, who is the deputy president of the Cambodian National Rescue Party. Sokha stated that exhibits at the Tuol Sleng Genocide Museum were fabricated and that the artifacts had been faked by the Vietnamese following their invasion in 1979. Sokha's party has claimed that his comments were taken out of context. Filmmaker Rithy Panh, a survivor of the genocide, is "considered by many to be the cinematic voice of Cambodia." Panh has directed several documentaries on the genocide, including S-21: The Khmer Rouge Killing Machine, which has been noted by critics for "allow[ing] us to observe how memory and time may collapse to render the past as present and by doing so reveal the ordinary face of evil." The genocide is portrayed in the 1984 Academy Award-winning film The Killing Fields and in Patricia McCormick's 2012 novel Never Fall Down. The genocide is also recounted by Loung Ung in her memoir First They Killed My Father (2000). The book was adapted into a 2017 biographical film directed by Angelina Jolie. Set in 1975, the film depicts 5-year-old Ung who is forced to be trained as a child soldier while her siblings are sent to labor camps by the Khmer Rouge regime. ^ a b Ben Kiernan. The Demography of Genocide in Southeast Asia. The Death Tolls in Cambodia, 1975-79,and East Timor, 1975-80. Critical Asian Studies, 35:4 (2003), 585-597. ^ Jackson, Karl D (1989). Cambodia, 1975–1978: Rendezvous with Death. Princeton University Press. p. 219. ISBN 978-0-691-02541-4. ^ Locard, Henri (March 2005). "State Violence in Democratic Kampuchea (1975–1979) and Retribution (1979–2004)". European Review of History. 12 (1): 121–143. CiteSeerX 10.1.1.692.8388. doi:10.1080/13507480500047811. Since 1979, the so-called Pol Pot regime has been equated to Hitler and the Nazis. This is why the word 'genocide' (associated with Nazism) has been used for the first time in a distinctly Communist regime by the invading Vietnamese to distance themselves from a government they had overturned. This 'revisionism' was expressed in several ways. The Khmer Rouge were said to have killed 3.3 million, some 1.3 million more people than they had in fact killed. There was one abominable state prison, S–21, now the Tuol Sleng Genocide Museum. In fact, there were more than 150 on the same model, at least one per district. ^ "Mapping the Killing Fields". Documentation Center of Cambodia. Archived from the original on 26 March 2016. Retrieved 6 June 2018. Through interviews and physical exploration, DC-Cam identified 19,733 mass burial pits, 196 prisons that operated during the Democratic Kampuchea (DK) period, and 81 memorials constructed by survivors of the DK regime. ^ Kiernan, Ben (2014). The Pol Pot Regime: Race, Power, and Genocide in Cambodia Under the Khmer Rouge, 1975–79. Yale University Press. p. 464. ISBN 9780300142990. Like all but seven of the twenty thousand Tuol Sleng prisoners, she was murdered anyway. ^ a b c Southerland, D (20 July 2006). "Cambodia Diary 6: Child Soldiers — Driven by Fear and Hate". Retrieved 28 March 2018. ^ Mendes 2011, p. 13. ^ Alvarez 2001, p. 12. ^ Edward Kissi (20 March 2006). Revolution and Genocide in Ethiopia and Cambodia. p. 128. ISBN 9780739160374. ^ Philip Spencer (2012). Genocide Since 1945. p. 69. ISBN 9780415606349. ^ Will Podmore (13 October 2008). British Foreign Policy since 1870. p. 176. ISBN 9781462835775. ^ Rummel, R. J. (2011). Death by Government. p. 191. ISBN 978-1412821292. ^ Philip Spencer (2012). Genocide Since 1945. p. 71. ISBN 9780415606349. ^ Brinkley 2011, p. 56. ^ SarDesai 1998, pp. 161–163. ^ Totten, Samuel; Bartrop, Paul R. (2008). Dictionary of Genocide: A-L. ABC-CLIO. p. 64. ISBN 978-0313346422. Retrieved 15 April 2017. ^ Wessinger, Catherine (2000). Millennialism, Persecution, and Violence: Historical Cases. Syracuse University Press. p. 282. ISBN 9780815628095. ^ Rummel, Rudolph J. (2001). "Chapter 6: Freedom Virtually Ends Genocide and Mass Murder". Saving Lives, Enriching Life: Freedom as a Right And a Moral Good. ^ Alvarez 2001, p. 50. ^ Alvarez 2007, p. 16. ^ Hannum 1989, pp. 88–89. ^ a b c Hunt, Michael H. (2014). The World Transformed: 1945 to the Present. New York, NY: Oxford University Press. p. 377. ISBN 978-0-19-937102-0. ^ Kiernan 2003, p. 29. ^ "Propaganda, Torture and French Colonial Heritage: Looking into the Methods of the Khmer Rouge | Cambodia Tribunal Monitor". ^ "Chilling Evidence in Khmer Rouge Trial". ^ "Barbarous KR medical experiments uncovered". 23 June 2000. ^ "Tribunal Hears of Secret Medical Experiments". 22 September 2016. ^ Beachler 2011, p. 45. ^ Bartrop 2012, p. 261. ^ Tyner 2012, p. 145. ^ Mayersan 2013, pp. 183–184. ^ Power 2002, p. 96. ^ Hinton & Lifton 2004, p. 23. ^ Kurlantzick 2008, p. 193. ^ a b PoKempner 1995, p. 106. ^ SarDesai 1998, p. 163. ^ Brinkley 2011, pp. 64–65. ^ PoKempner 1995, pp. 107–108. ^ Haas 1991, pp. 17–18, 28–29. ^ Thayer 1991, pp. 180, 187–189. ^ Brinkley 2011, pp. 58, 65. ^ Etcheson 2005, p. 14. ^ Donlon 2012, p. 103. ^ Stanton 2013, p. 411. ^ Bartrop 2012, pp. 166–167. ^ Corfield 2011, p. 855. ^ de los Reyes et al. 2012, p. 1. ^ Mydans, Seth (14 March 2013). "Ieng Sary, Khmer Rouge Leader Tied to Genocide, Dies at 87". The New York Times. Retrieved 14 March 2013. ^ Mydans, Seith (2017). "Khmer Rouge Trial, Perhaps the Last, Nears End in Cambodia". The New York Times. ^ Chan 2004, p. 256. ^ Alvarez 2001, p. 56. ^ Boyle 2009, p. 95. ^ "The Killing Fields: authentically good". The Guardian. London. 12 March 2009. ^ a b Debra Lau Whelan (10 October 2012). "SLJ Speaks to National Book Award Finalists". School Library Journal. Retrieved 15 November 2012. ^ Loung., Ung (2000). First they killed my father : a daughter of Cambodia remembers (1st ed.). New York: HarperCollinsPublishers. ISBN 978-0060193324. OCLC 41482326. ^ Debruge, Peter (3 September 2017). "Telluride Film Review: 'First They Killed My Father: A Daughter of Cambodia Remembers'". Variety. Retrieved 20 September 2017. Alvarez, Alex (2001). Governments, Citizens, and Genocide: A Comparative and Interdisciplinary Approach. Indiana University Press. ISBN 978-0253338495. Alvarez, Alex (2007). "The Prevention and Intervention of Genocide During the Cold War Years". In Samuel Totten (ed.). The Prevention and Intervention of Genocide. Transaction. pp. 7–30. ISBN 978-0765803849. Barron, John; Anthony Paul (1977). Murder of a gentle land: the untold story of a Communist genocide in Cambodia. Reader's Digest Press. ISBN 978-0883491294. Bartrop, Paul R. (2012). A Biographical Encyclopedia of Contemporary Genocide. ABC-CLIO. ISBN 978-0313386787. "Khmer Rouge trial ends with defendants denying charges". BBC. 31 October 2013. Retrieved 5 January 2014. Boyle, Deirdre (2009). "Shattering Silence: Traumatic Memory and Reenactment in Rithy Panh's S-21: The Khmer Rouge Killing Machine". Framework: The Journal of Cinema and Media. 50 (1/2): 95–106. doi:10.1353/frm.0.0049. JSTOR 41552541. Brinkley, Joel (2011). Cambodia's Curse: The Modern History of a Troubled Land. PublicAffairs. ISBN 978-1-610-39001-9. Buncombe, Andrew (7 June 2013). "Cambodia passes law making denial of Khmer Rouge genocide illegal". The Independent. Retrieved 2 January 2014. Chan, Sucheng (2004). Survivors: Cambodian Refugees in the United States. University of Illinois Press. ISBN 978-0252071799. Corfield, Justin J. (2011). "Nuon Chea". In Spencer C. Tucker (ed.). The Encyclopedia of the Vietnam War A Political, Social, and Military History. ABC-CLIO. ISBN 978-1-85109-961-0.
de los Reyes, Faith Suzzette; Mattes, Daniel; Lee, Samantha B.; Van Tuyl, Penelope (2012). KRT TRIAL MONITOR (PDF). Asian International Justice Initiative. Archived from the original (PDF) on 4 March 2016. Retrieved 7 January 2014. DeMello, Margo (2013). Body Studies: An Introduction. Routledge. ISBN 978-0415699303. Donlon, Fidelma (2012). "Hybrid Tribunals". In William A. Schabas, Nadia Bernaz (ed.). Routledge Handbook of International Criminal Law. Routledge. pp. 85–106. ISBN 978-0415524506. Dutton, Donald G. (2007). The Psychology of Genocide, Massacres, and Extreme Violence: Why Normal People Come to Commit Atrocities. Praeger. ISBN 978-0275990008. Etcheson, Craig (2005). After the Killing Fields: Lessons from the Cambodian Genocide. Greenwood. ISBN 978-0275985134. Frey, Rebecca Joyce (2009). Genocide and International Justice. Facts On File. ISBN 978-0816073108. Haas, Michael (1991). Cambodia, Pol Pot, and the United States: The Faustian Pact. ABC-CLIO. Hannum, Hurst (1989). "International Law and Cambodian Genocide: The Sounds of Silence". Human Rights Quarterly. 11 (1): 82–138. doi:10.2307/761936. JSTOR 761936. Heuveline, Patrick (1998). "'Between One and Three Million': Towards the Demographic Reconstruction of a Decade of Cambodian History (1970–79)". Population Studies. 52 (1): 49–65. doi:10.1080/0032472031000150176. JSTOR 2584763. PMID 11619945. Hinton, Alexander Laban; Lifton, Robert Jay (2004). "In the Shadow of Genocide". Why Did They Kill? : Cambodia in the Shadow of Genocide. University of California Press. ISBN 978-0520241794. "KAING Guek Eav". Extraordinary Chambers in the Courts of Cambodia (ECCC). Retrieved 19 August 2015. Kiernan, Ben (2003). "Twentieth-Century Genocides Underlying Ideological Themes from Armenia to East Timor". In Robert Gellately, Ben Kiernan (ed.). The Specter of Genocide: Mass Murder in Historical Perspective. Cambridge University Press. ISBN 978-0521527507. Kurlantzick, Joshua (2008). "China's Growing Influence in Southeast Asia". China's Expansion Into the Western Hemisphere: Implications for Latin America and the United States. Brookings Institution Press. ISBN 978-0-815-77554-6. MacKinnon, Ian (12 November 2007). "Leading Khmer Rouge figures arrested". The Guardian. Retrieved 7 January 2014. Mayersan, Deborah (2013). "'Never Again' or Again and Again". In Deborah Mayersen, Annie Pohlman (ed.). Genocide and Mass Atrocities in Asia: Legacies and Prevention. Routledge. ISBN 978-0415645119. Mendes, Errol (2011). Peace and Justice at the International Criminal Court: A Court of Last Resort. Edward Elgar. ISBN 978-1849803823. Munthit, Ker (19 November 2007). "Ex-Khmer Rouge Head of State Charged". Associated Press. Archived from the original on 10 June 2014. Retrieved 7 January 2014. PoKempner, Dinah (1995). Cambodia at War. Human Rights Watch. ISBN 978-1564321503. Power, Samantha (2002). A Problem from Hell: America and the Age of Genocide. Basic Books. ISBN 978-0-465-06150-1. SarDesai, D.R. (1998). Vietnam, Past and Present. Westview. ISBN 978-0813343082. Seybolt, Taylor B.; Aronson, Jay D.; Fischoff, Baruch (2013). Counting Civilian Casualties: An Introduction to Recording and Estimating Nonmilitary Deaths in Conflict. Oxford University Press. ISBN 9780199977314. Solarz, Stephen (1990). "Cambodia and the International Community". Council on Foreign Relations. Stanton, Gregory H. (2013). "The Call". In Samuel Totten, Steven Leonard Jacobs (ed.). Pioneers of Genocide Studies. Transaction. pp. 401–428. ISBN 978-1412849746. "Cambodia sentence two top Khmer Rouge leaders to life in prison". The Telegraph. Associated Press. 7 August 2014. Retrieved 7 August 2014. Terry, Fiona (2002). Condemned to Repeat? : The Paradox of Humanitarian Action. Cornell University Press. ISBN 978-0801487965. Thayer, Nate (1991). "Cambodia: Misperceptions and Peace". The Washington Quarterly. 14 (2): 179–191. doi:10.1080/01636609109477687. Tyner, James A. (2012). Genocide and the Geographical Imagination: Life and Death in Germany, China, and Cambodia. Rowman & Littlefield. ISBN 978-1442208988. Verkoren, Willemijn (2008). The Owl and the Dove: Knowledge Strategies to Improve the Peacebuilding. Amsterdam University Press. ISBN 978-9056295066. Waller, James. "Communist Mass Killings: Cambodia (1975–1979)". Keene State College. Cohen Center, Keene, NH. 17 February 2015. Powerpoint Lecture.